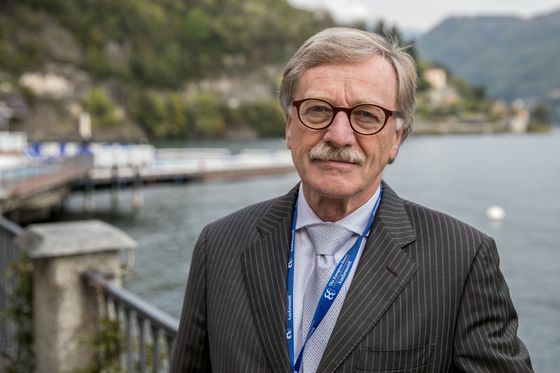 Yves Mersch was nominated as the next vice chair of the euro area’s bank watchdog in a belated move by the European Central Bank to fix one of the most gaping holes in its governance. The selection of the Executive Board member follows two months of inaction on the matter after his colleague, Sabine Lautenschlaeger, finished her term in the job at the Single Supervisory Mechanism. That temporarily removed a formal link between the panels running the ECB and the bank watchdog. The vice chair is limited to a term of five years, mismatched to the eight-year stint for the six ECB Executive Board members. The rules state only one of them can be chosen for the role. The vacancy -- along with another three empty board seats at the SSM -- has been a growing embarrassment to the central bank. In the absence of a successor to Lautenschlaeger, ECB President Mario Draghi took on some of the associated responsibilities in the interim in addition to his own. The SSM directly oversees almost 120 significant banks operating in euro-zone member states. Mersch’s appointment underscores the ECB’s struggle to achieve gender balance at the highest level. Until this year, when SSM Chair Daniele Nouy was replaced by Italy’s Andrea Enria and Lautenschlaeger ended her term, the top two positions at the supervisor had been filled by women. That was inevitable, since Lautenschlaeger is the only woman currently on the Executive Board. Mersch’s selection must be confirmed by the European Parliament, a place where he’s previously encountered difficulties. His own appointment to the ECB Executive Board was held up for months by lawmakers dissatisfied at governments’ repeated nominations of male candidates in an organization already predominantly run by men. Mersch, 69, is a former governor of Luxembourg’s central bank. Together with his stint in the ECB’s leadership echelon, he has served on the Governing Council since its creation -- longer than anyone else. His term on the Executive Board ends in December 2020, suggesting he may only be in the SSM role for a relatively short time.